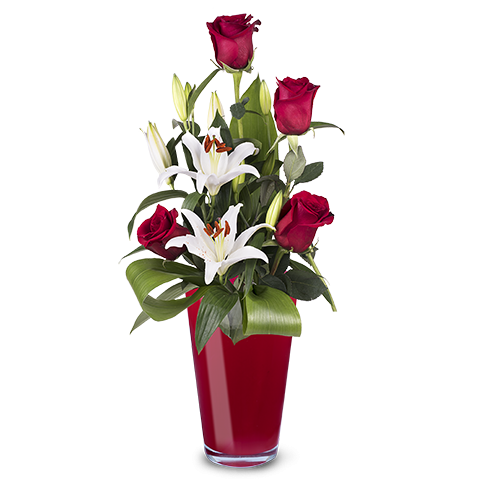 Share a sweet bouquet of red roses and white lilies today. International flower delivery to over 100 countries with FloraQueen. 7 Days freshness guaranteed. Halloween is the spookiest night of the year! A night of tricks and treats, of ghouls and ghosts and flowers? This year try something new. Perhaps you typically decorate by putting pumpkins and candles around your house. How about adding a bouquet of exquisite flowers to your decor for Halloween 2018 to set your house apart from the rest of the neighbourhood? Nature has blessed us with numerous flowers in wonderful shades of orange and red, and what could be better on Halloween than pumpkin orange and blood red? To get into the spirit of the occasion FloraQueen has put together a range of flower arrangements that are perfect for this scary celebration. So, for Halloween 2018, do something different. international flower delivery delivery of terrifyingly apt flower arrangements. Make this Halloween one to remember, make it truly spooktacular! Want to celebrate the holidays with your friends and family but live far away, well rest assured! FloraQueen's reliable international flower delivery services ensure that you can send them a smile on this annual occasion even from afar. Our network of hardworking, creative local florists are waiting for your order so they can create a beautiful bouquet just for you. And with Halloween fast approaching send your family some spooky holiday spirit with one of our Halloween 2018 bouquets, perfect to add to their Halloween decorations with orange, yellow and red hues. Stand out this year, select FloraQueen for our international flower delivery and send a Halloween bouquet!